Washington, DC-- When National Endowment for the Arts (NEA) Chairman Rocco Landesman arrived at the agency in 2009, he began a national conversation around "creative placemaking," how cities and towns are using the arts to shape their social, physical, and economic characters. Today's announcement of 80 Our Town grant awards represents the NEA's latest investment in creative placemaking, totaling $4.995 million and reaching 44 states and the District of Columbia. Combined with grants from 2011, the NEA has invested $11.58 million in Our Town projects in all 50 states and the District of Columbia. Through Our Town, the NEA supports creative placemaking projects that help transform communities into lively, beautiful, and sustainable places with the arts at their core. The grantee projects will improve quality of life, encourage creative activity, create community identity and a sense of place, and help revitalize local economies. All Our Town grant awards were made to partnerships that consisted of a minimum of a not-for-profit organization and a local government entity. "Cities and towns are transformed when you bring the arts — both literally and figuratively — into the center of them,” said NEA Chairman Landesman. "From Teller, Alaska, to Miami, Florida, communities are pursuing creative placemaking, making their neighborhoods more vibrant and robust by investing in the performing, visual, and literary arts. I am proud to be partnering with these 80 communities and their respective arts, civic, and elected leaders." NEA Director of Design Jason Schupbach said, "It's an exciting time for evolution and exploration in the creative peacemaking field, and I'm certain this year’s Our Town grants will bear fruit for their communities and lessons for the field as a whole." 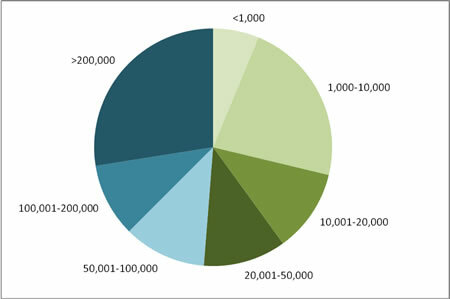 The Our Town projects represent a diversity of population sizes, geography, and artistic discipline. The projects are spread across 44 states plus the District of Columbia. See map here. Projects support artist communities, arts education, dance, design, folk and traditional arts, literature, presenting and multidisciplinary, media arts, music, theater, and visual arts. 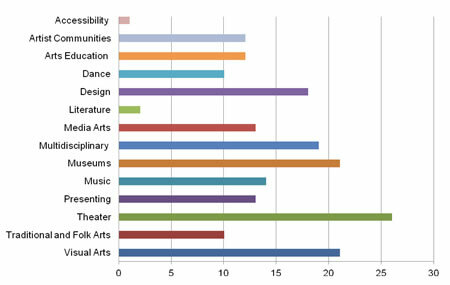 A quarter of the grants fund arts engagement activities in the performing, literary, and arts education fields. Artistic disciplines represented by organizations included as partners on 2012 Our Town projects. The numbers along the bottom indicate the number of partner organizations in the total pool of 80 awards. The NEA received 317 applications for Our Town that were assigned to one of three panels. Arts engagement. This panel reviewed proposed projects where artistic production is the primary driver of creative placemaking. These projects include artistic programming that fosters interaction among community members, arts organizations, and artists or artistic practices that use existing cultural and community assets. Festivals and public art commissions fall into this category. Cultural planning and design. Cultural planning refers to building local support systems and places necessary for creative placemaking to succeed, including creative asset mapping, master planning for cultural districts, creative industries, and creative entrepreneurship. Design includes the design of artist spaces, cultural facilities, public spaces for cultural engagement, and wayfinding systems. Non-metro and tribal communities. This panel reviewed applications from smaller communities that are not adjacent to a metropolitan area. This panel looked at the unique needs and assets of smaller, rural, and isolated communities that do not have the same access to resources as many larger communities. Therefore, a bedroom community that is a small suburb of a large city, for instance, was not reviewed by this panel. This panel reviewed arts engagement, cultural planning, and design projects. Our Town grantees demonstrate their creativity not only through the nature of their projects but also in the partnerships they build to bring those projects to life. Broad-based partnerships allow organizations to leverage more resources, garner more and different expertise, access new networks, and strengthen ties to their communities, eventually making for more successful projects. Within the 80 projects there are 566 different partners of which 240 are arts organizations (including 44 local arts agencies and four state arts agencies). The other partners include aging services agencies, botanic gardens, religious institutions, and scientific organizations; local businesses, including banks and farms; business improvement districts, educational institutions; local, state, and federal government agencies; and land trusts. Rahway is located 20 miles south of Manhattan. Union County Arts Center, the City of Rahway's Redevelopment Agency, Arts Guild New Jersey, LuceGroup, Rahway Arts District, and artistic and community partners will collaborate on RAHWAY ARTsPART, a series of creative performances and community engagement activities. This grant will build off of the arrival of seven new performance groups, including the American Repertory Ballet, Nai-Ni Chen Dance Company, StrangeDog Theatre Company, the World Beat Box Association, and others to do programming not only in a new theater, but all over town. In the middle of Denver is Sustainability Park, where an urban farmers collaborative established three urban gardens and Feed Denver has installed an aquaponics system growing koi and tilapia. The arts collective RedLine, City of Denver, and seven additional organizations will collaborate on A Village Environment, a project within the city's Sustainability Park that involves the creation of public sculptures that will produce renewable energy. The public sculptures will be commissioned via a competitive selection process, with the requirement of artistic excellence and the ability to generate power. Accompanying programs and workshops led by artists will engage the community on the benefits of integrating sustainable design into daily life. The City of Omaha is partnering with Love’s Jazz and Art Center and local organizations on the Street of Dreams project, part of the revitalization plans for North Omaha’s 24th and Lake Street District, which is purported to have the nation's highest African-American childhood poverty rate. The grant will support a feasibility and community design study to re-imagine Festival Square and will allow the partners to engage visual artist and urban planner Theaster Gates to transform a nearby vacant building into a central space for artists and residents. Milwaukee is the largest city in the state and a commercial and industrial hub for the Great Lakes region. Milwaukee Ballet is teaming with the City of Milwaukee to create schematic designs for the Harmony Initiative, a new cultural facility in the Downtown Center District that will focus on performing arts, higher education, and health and wellness. The facility will integrate programming and generate shared revenue for three organizations: Milwaukee Ballet, University of Wisconsin-Milwaukee Peck School of the Arts, and Medical College of Wisconsin Sports Medicine. Nevada County, a “Gold Rush”-founded community in the Sierra Nevada foothills of Northern California, has more artists per capita than any other county in the state. Nevada County Arts (NCArts) will use its grant to fund the Tribute Trail Environmental Art Project. NCArts is partnering with the City of Nevada City, along with more than ten conservation groups, cultural organizations, and educational institutions on the project. The partners will commission and install 15 environmentally based temporary public artworks along the Deer Creek Tribute Trail, a recently completed nine-mile river parkway that links Nevada City’s downtown historic and economic area with the surrounding natural features. The Santo Domingo Pueblo, located between Albuquerque and Santa Fe, is currently occupied by more than 3,600 tribal members. The Santo Domingo Planning Department and Housing Authority, Enterprise Community Partners, together with five local partners, will work together on a cultural district plan for Santo Domingo Pueblo. The tribe is looking for new ideas to address its challenges, which include 25 percent of tribal members living below the poverty level and a 23 percent unemployment rate. The cultural district plan will document the cultural heritage of the Santo Domingo Tribe, establishing livable and culturally appropriate guidelines for historic adobe structures and new development. Each webinar will run from 4:00 - 5:00 PM EDT and may be accessed at arts.gov, where the sessions will also be archived. Each webinar will be moderated by NEA Design Director Jason Schupbach. Other participants will be announced shortly on arts.gov.